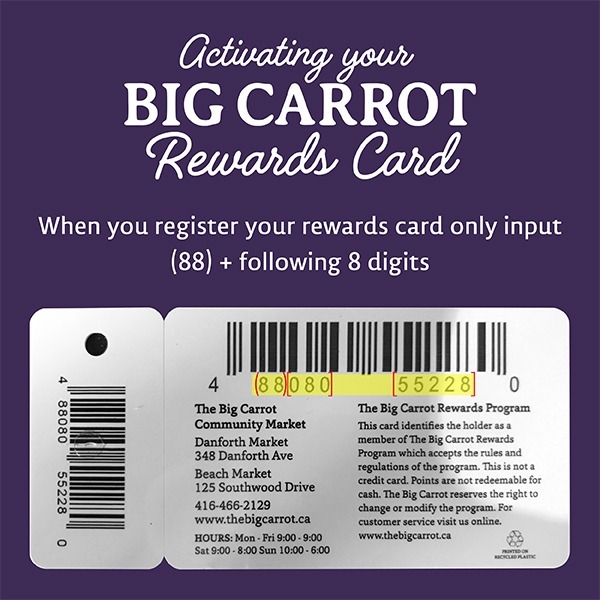 At The Big Carrot, we promote livestock production that is sustainable and healthy for all involved: from farmers to their animals, communities and our customers. 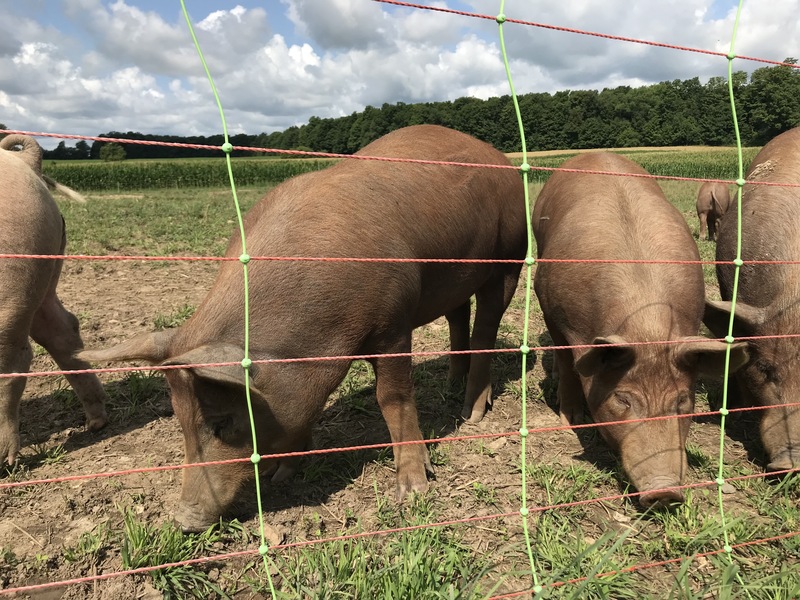 We believe in supporting local, Ontario farmers who are committed to raising their animals with care and respect. Do you know where your food comes from? We do! 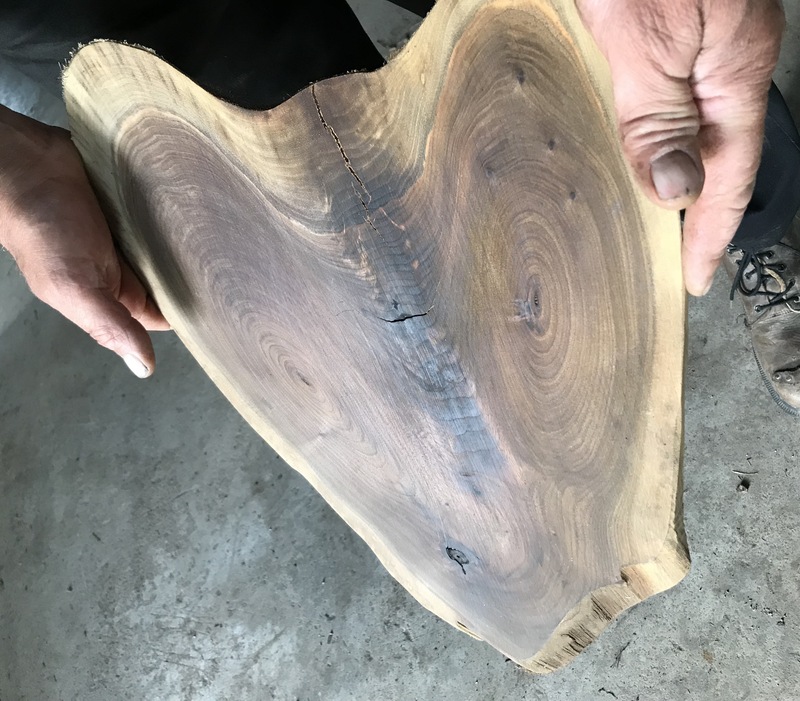 Building relationships with our suppliers is important not only to ensure quality for our customers but also as an opportunity to learn and educate. 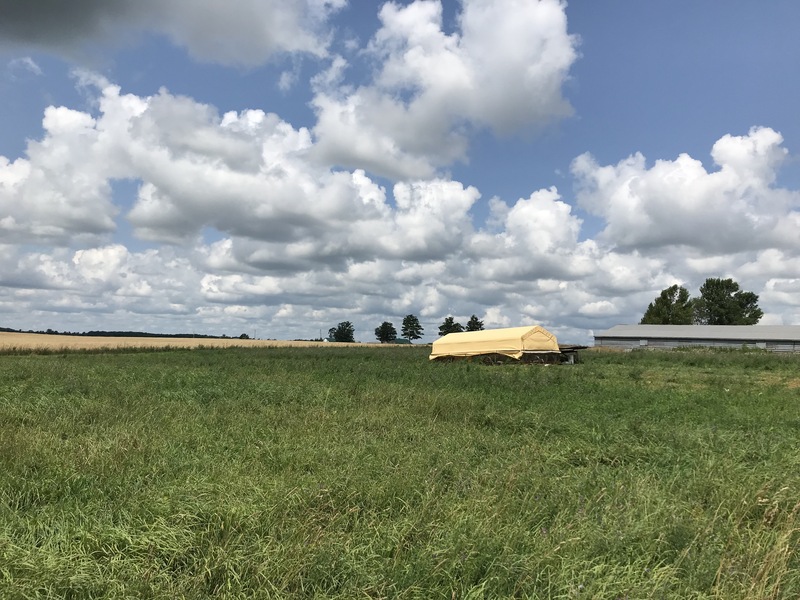 This summer we visited Howick Community Farms, a partnership of Mennonite farmers in Howick Ontario (2.5 hours west of Toronto in Huron County). These farmers share a commitment to quality and integrity as well as innovative infrastructure. They sell their combined bounty under the HCF brand. HCF supplies The Big Carrot with pastured eggs, chicken, lamb and pork. 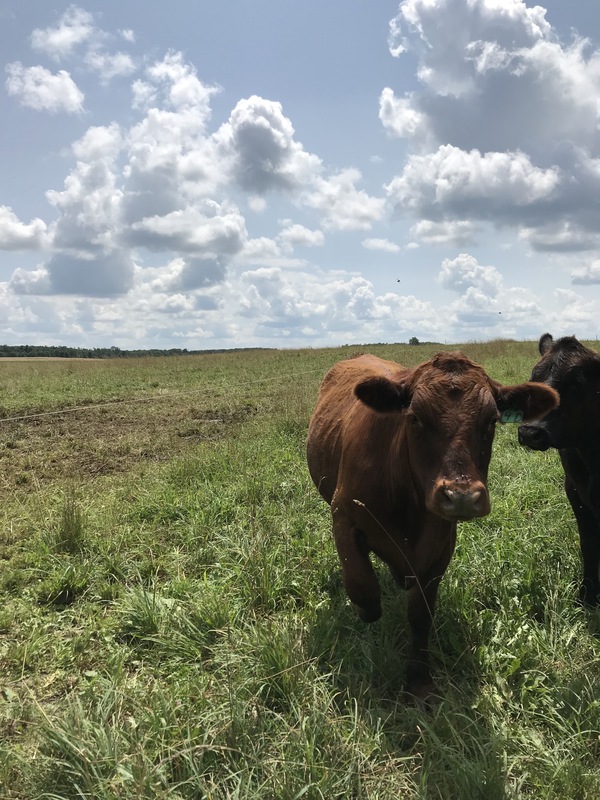 They will also begin to supply us with pastured beef in September. Touring the farms, it was evident that the animals were happy, healthy and benefiting from the passion and dedication of their stewards. Here are some trip highlights. The hoop house has open access to the fenced pasture, which is rotated through the season to provide fresh grass. This small flock of 500 hens is one of two in the HCF community that is a “Grandfather Flock”. Grandfather flocks are non-transferable and may only be passed on within the same family, on the same property. 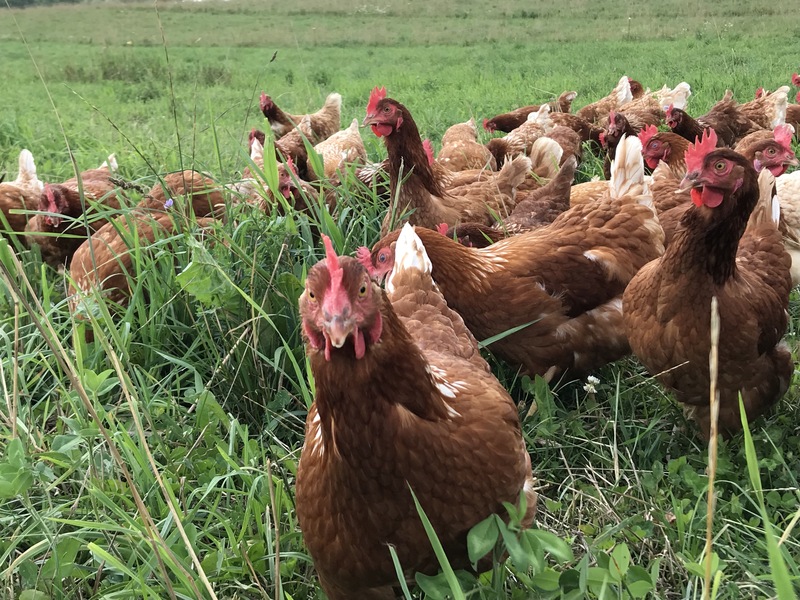 The remaining HCF farmers can only raise up to 100 laying hens based on the existing quota system which is built to support industrial egg producers who typically house tens of thousands of hens in barns. 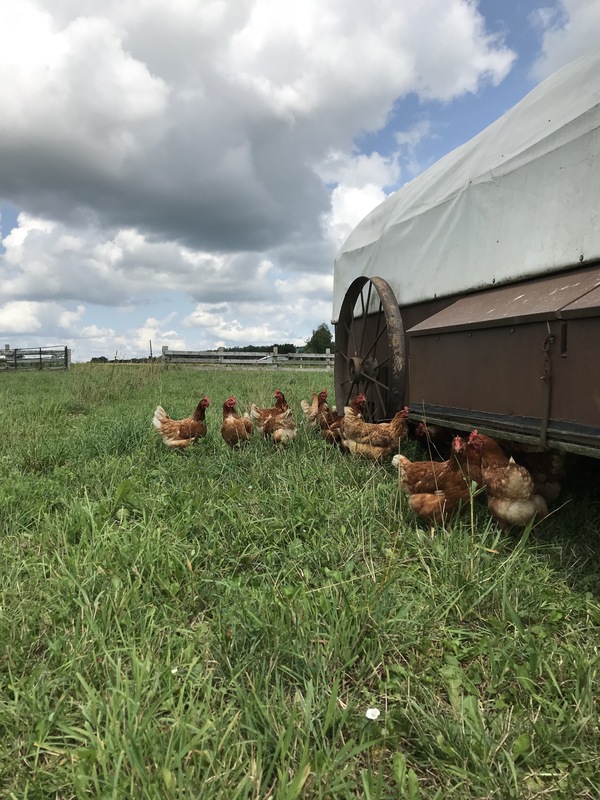 Different from the hoop house, this flock’s structure looks like a covered wagon. They have a stepped interior that provides lots of perches. The side of the wagon has boxes that have a little canvas drape. 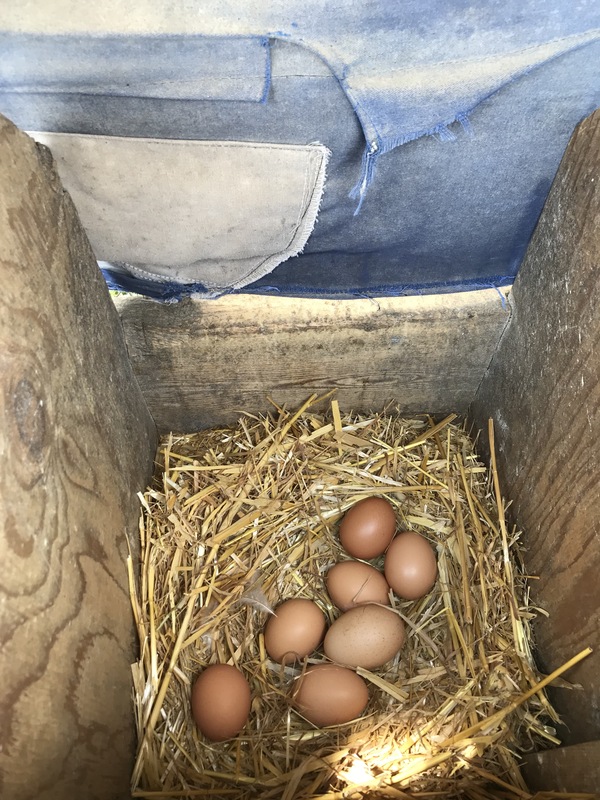 The hens can pop in and out to lay their eggs in privacy. It is efficient and so simple. 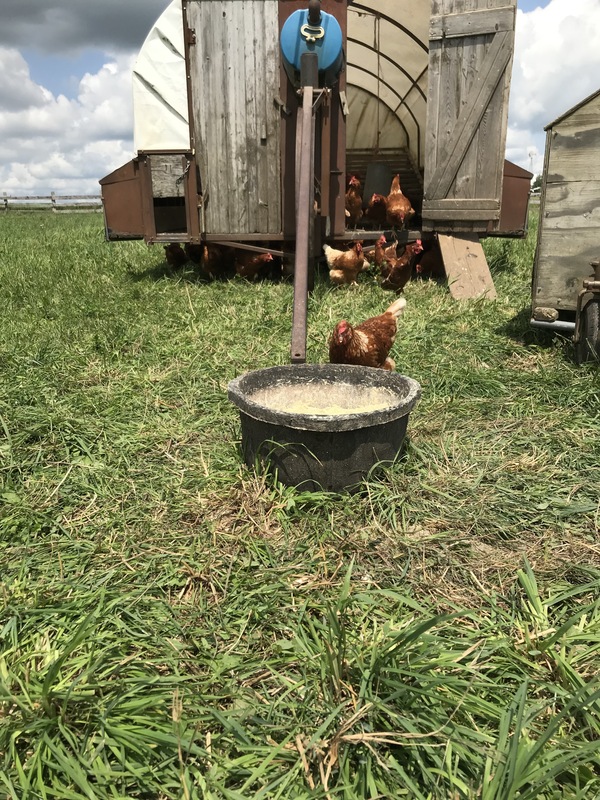 There is a small two-room HCF egg grading station on site and any egg that is sold from a location other than the farm gate must be graded in a federally registered egg grading station. 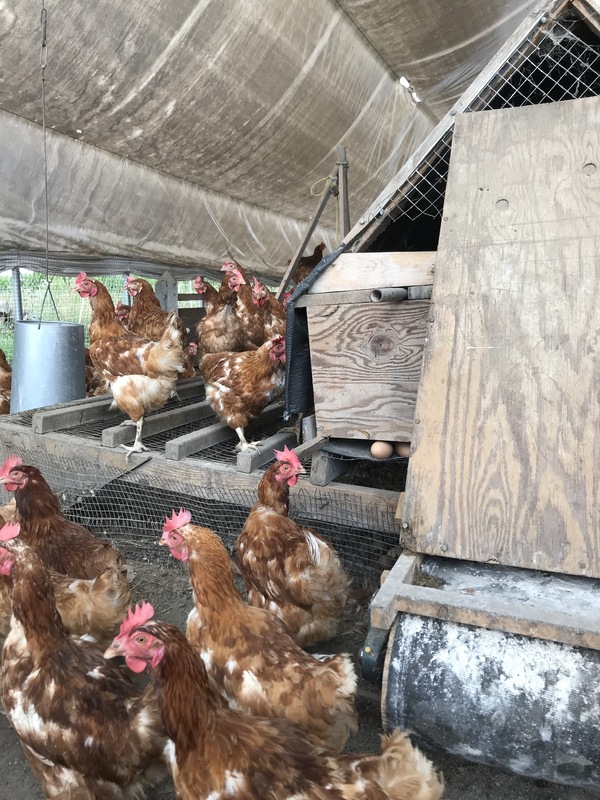 Eggs are graded according to interior quality, weight, cleanliness and shell construction and receive one of three grades. Only Grade As are sold at grocery stores. After the eggs are washed, inspected, candled, weighed sorted and packed they are refrigerated in a modern looking refrigerator that is actually still cooled with snow! Non –GMO corn dries in wire corncribs and is purchased by HCF members for their supplemental feed. Many years ago the church community made the collective decision not to use any genetically modified seeds in their production. They also buy certified organic mineral supplements, even though the eggs are not certified organic. The lambs have a lovely lush pasture surrounded by shady trees. They have become quite attached to two cows and insist on staying together or they bawl and complain! This friendship has its perks; the cows provide a measure of protection in case of predators. The pigs are grouped in age/social groupings and were happily lounging in the shade of their open-ended shelter when we arrived (it was a hot day). They were right at the fence line to see us as we approached. 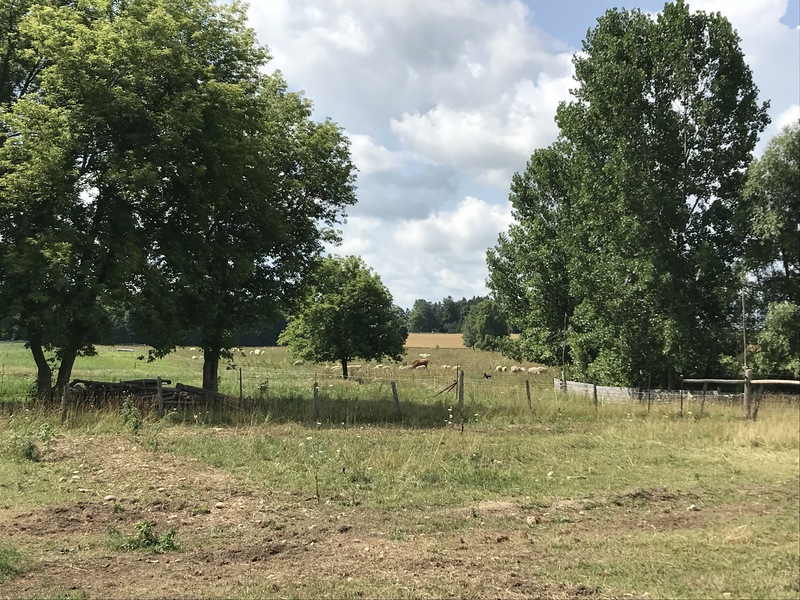 The hog pasture was huge and lush bounded by a windbreak of trees. A wind turbine pump feeds the water station along with a system of gravity feed hoses that keep the water cold, clean and fresh. It also makes happy mud puddles to laze about in. 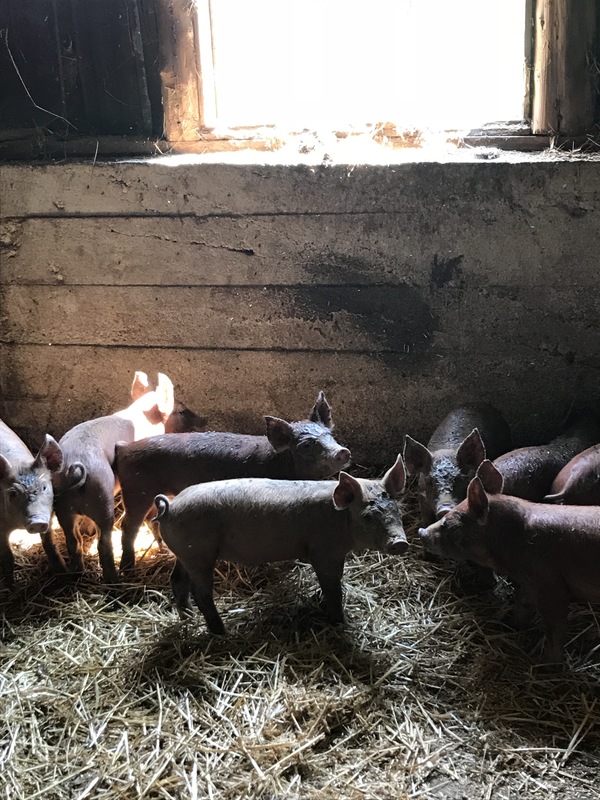 The sows and boar were housed in the gestation barn. 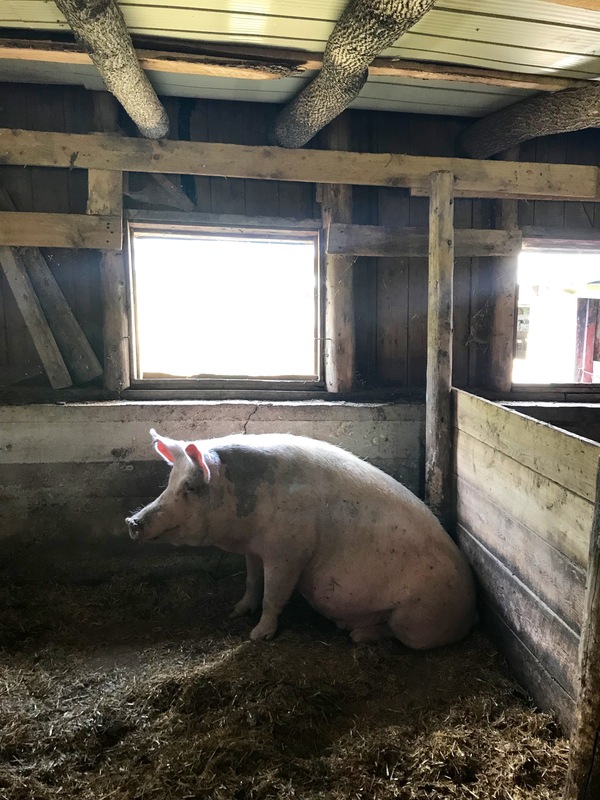 With open windows, fresh air and sun: no restraints or gestation crates. 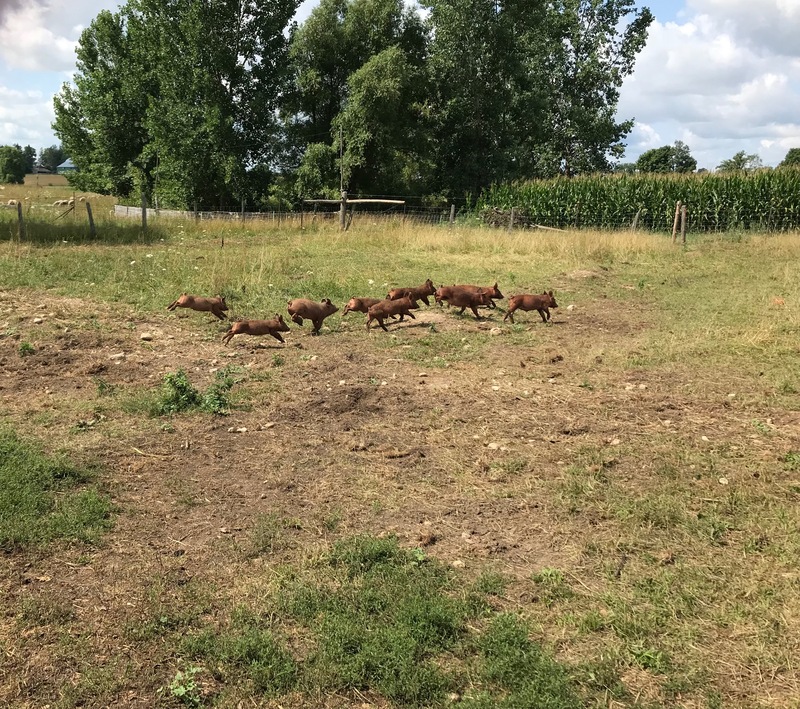 The piglets could run in and out into the safe enclosed pasture. The sow will have two litters a year over four years. All of the births are managed on farm by the farmers with the animals’ full life cycle happening on farm. When the sow has reached the end of her breeding years she will be culled and used for meat for the farmer’s family and community. The HCF community conveniently has access to provincially regulated abattoirs needed for all of their livestock. This reduces the animals transport time and the stress that comes along with transportation to slaughter. This is the preferred design of mobile chicken units at HCF. The back flap flips up so that when the lightweight unit is moved the birds are left behind. There is no risk of accidentally harming a bird by the moving structure. 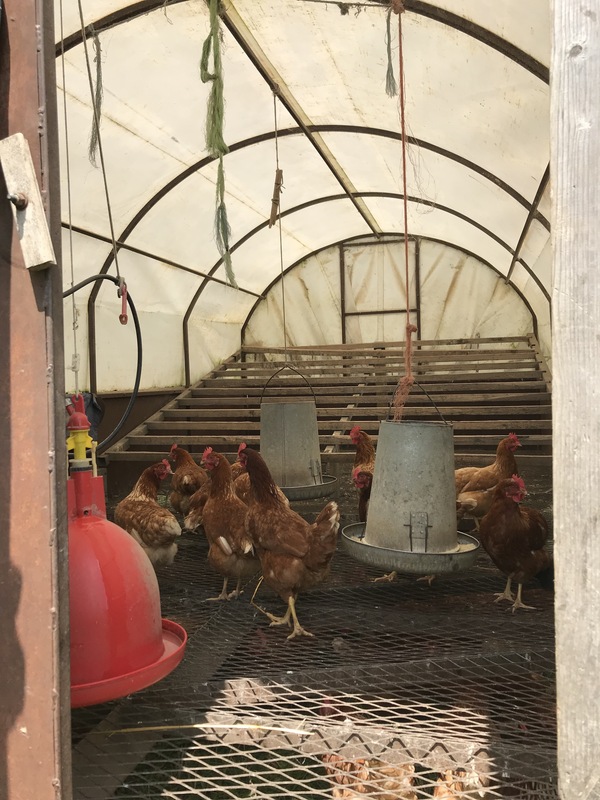 The sides roll up and down and the units can be positioned separately for better air flow in the hot months or grouped together as the last cycle of fall birds are raised and the temperatures are cooling. 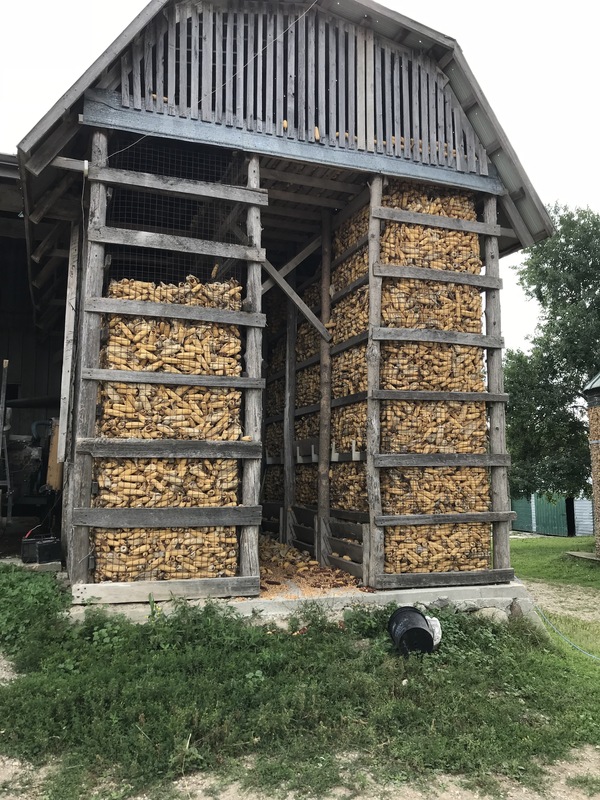 This 250 flock of ‘broiler chickens’ is part of the Artisanal program created by the Chicken Farmers of Ontario in 2016. The CFO mainly deals with larger operations that must produce to a set quota of tens of thousands of chickens. This innovative Artisanal program allows non-quota holding farmers to raise birds in much smaller numbers. 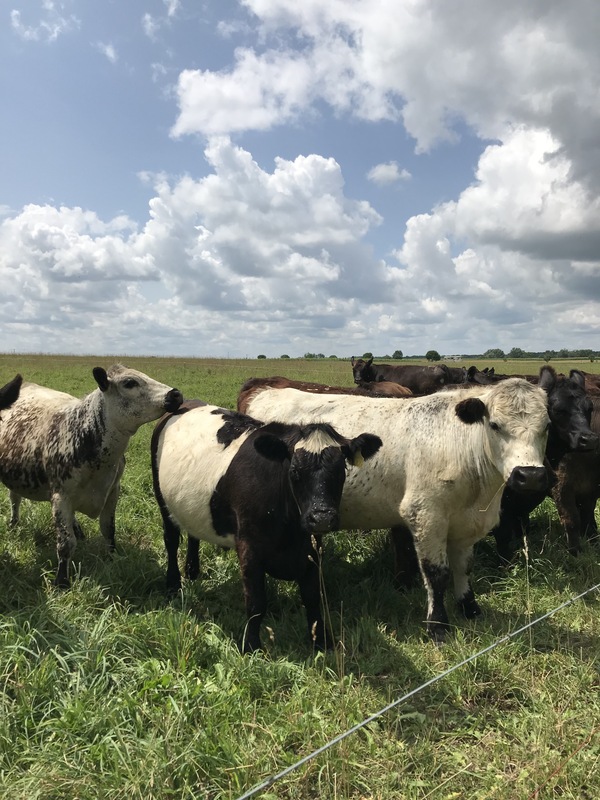 HCF started raising Belted Galways but is deeply invested in raising the best breeds for the best-marbled grass fed beef in Ontario. This beautiful Red Devon (pictured below) is showing a lot of promise. HCF’s natural breeding program will take several years to develop but the early signs are very exciting. One heifer in particular enjoyed a good scratch from Adam, like an oversized dog. There rapport was evident. He pointed out so many amazing details that he is evaluating in his breeding program- indicators for butter fat, which correlates with the prime marbling, how the little swirl of hair at the nape of the neck tells you x or how a soft and silky hair coat that is loose to the touch indicates Y. We were struck throughout the day between the intersection of traditional knowledge, research and low- tech innovation. Throughout our day, Adam, the President of HCF, spoke at length about partnerships and economies built on trust and relationship. We are grateful for the HCF farmers who made time so that we can build this rapport.